By virtue of good management or good luck, Australia had a comfortable ride through the GFC. The latest data shows an economy struggling to transition out of an easy boom. Which means this time the ride will not be so smooth. 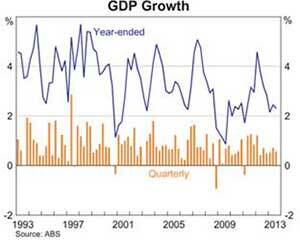 The November downgrade of medium term growth figures from 2.5-3.5% p.a to 2-3% p.a by the RBA does not bode well. The current annual rate sits at 2.3% p.a. As the graph clearly shows, GDP has fallen significantly since 2011-12. 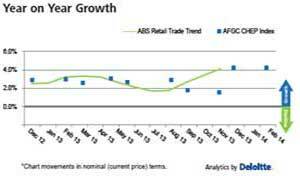 The RBA expect that growth will remain below trend before picking up thereafter. 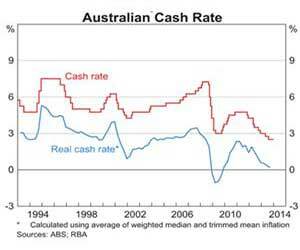 The official cash rate was left at 2.5% p.a in February, unchanged since the RBA lowered the rate in August by 25 basis points; the lowest in the last twenty years. In fact, it is the lowest rate since the RBA was established in 1959.
Business has been less responsive to the interest rate change, leaving the economy with a big unknown for 2014. 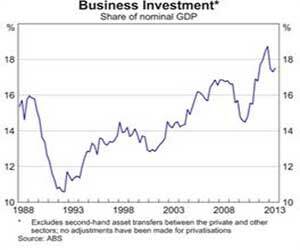 This is a concern because business investment as a share of nominal GDP has been in decline since 2013. 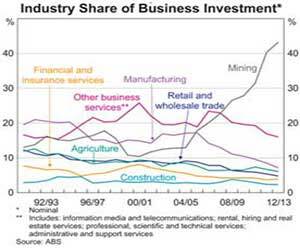 Goodbye mining investment boom, hello lackluster business investment. When broken down by industry, declining business investment has occurred in the non-mining industry for a much longer time period; but has been offset by rapid increase in mining investment since 2004. The decline of mining investment will have major ramifications for the Australian economy. 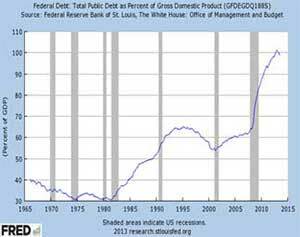 A conservative estimate is that the investment cliff will leave a gap of 3% of GDP; it is more likely 5%. The latest Chep index shows retail sales 4.2% higher in Dec 2013 compared with Dec 2012. On a quarterly basis the index was 4% higher in Dec 2013 compared with Dec 2012. This is the strongest sales growth since early 2010 and finally indicates consumers responding to the low interest rate environment. 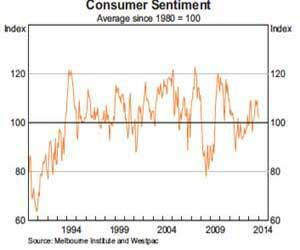 Despite increases in sales, the consumer confidence index produced by Westpac Melbourne Institute decreased to 103.3 in Jan 2014, down from 105.0 in Dec 2013. This is the lowest level the index has been since July 2013, but remains above the long-term average. 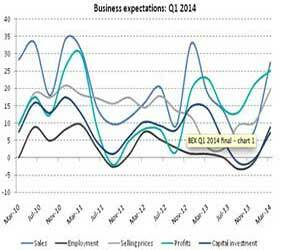 This graph produced by Dun and Blackstreet, clearly shows an upswing in expectations about sales, employment, selling prices, profits and capital investment for the first quarter of 2014. Perhaps the most important indicator is that 18% of businesses predict that they are planning to access new finance during Q1 to grow their operations: the highest response since Q4 2011. 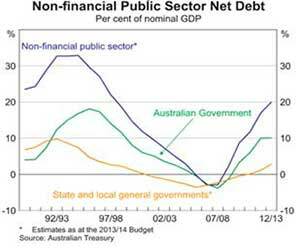 Australian government net debt as a percentage of nominal GDP for 2012-13 is sitting comfortably at 10%. If combined with the non-financial public sector this increases to 30%. Debt is expected to ‘blowout’ since Treasurer Hockey’s Mid Year Economic and Fiscal Outlook showed government debt set to increase by $17 billion beyond previously expected. Compare Australia’s debt to the US (left) or any country in Europe and all looks well. What is of concern however is that the combined tax revenue of Australia’s state and federal government fell to just 26.5% of GDP in 2011. Which, the OECD says, is the lowest level in two decades. The highest rate of unemployment in 10 years was reached in January, sitting at 6.0%. This was accompanied by a further decrease in the participation rate, from 64.6% in Dec to 64.5%. 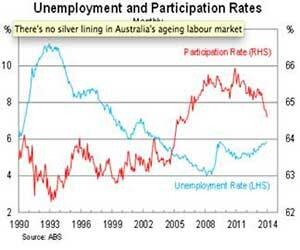 While these decreases are helping to keep unemployment in check it is not expected to stay submerged for long. Current forecasts have the rate climbing to a sustained rate of 6.25%. 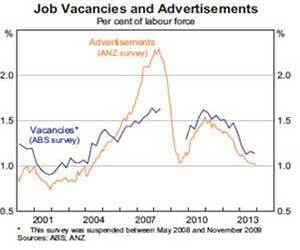 The graph clearly shows a trend decline in vacancies and advertisements since 2010. This confirms consumer’s expectations that unemployment will continue to rise in 2014. The Westpac Unemployment Expectations Index increased from 152.4 in Jan to 155.9 in February, a percentage change of 2.3% or a year on year increase of 7.5%. The key to the economic future of Australia now rests with the expansion of exports. This will only occur with a significant decrease in the exchange rate. 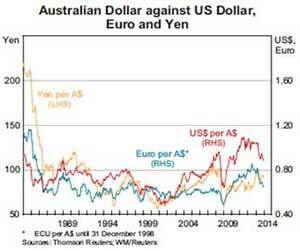 Gone are the extreme highs of mid 2012-13, where the $AUD breached parity. It has been fluctuating around 0.89c. Further decreases will be beneficial to exporting industries. 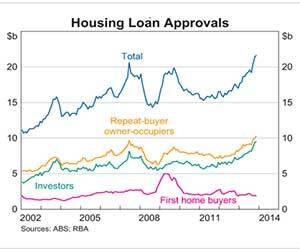 Monetary policy has rejuvenated the housing market and green shoots of recovery in the retail sector have been seen recently. However this does not calm growing fears over a lack of business investment and rising unemployment levels. As other developed countries are expected to kick out of the GFC black hole in 2014, Australia may be about to enter into it. There is no time for resting on laurels. Much needs to be done.